Chicago Tribune - A new device at Silver Cross Hospital is helping patients with GERD (gastroesophageal reflux disease) manage their symptoms without medications. The TIF procedure (transoral incisionless fundoplication) is performed through the patient's mouth. The TIF procedure has become an established treatment, and Silver Cross recently acquired the latest technology, the EsophyX Z device. 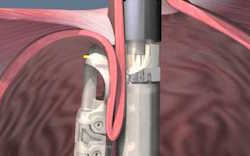 The EsophyX Z technology is used to reconstruct the antireflux valve between the esophagus and stomach.